Sometimes even some of the most grand homes have a modest sized living room. Suppose I am working with a retired couple who lives by themselves, but they love to host family dinners during the holidays. Their day to day life does not require a great deal of furniture, it only needs to accommodate the two of them, but the holidays will require more seating. Modest spaces can still be practical, comfortable and work for families of all sizes. See the tips below to learn more. If the floor plan is open, a sofa and perhaps a small chair can go in the living room. If there is a bar, using swivel stools allows people to eat and play games in this area, but also easily turn and partake in the conversation in the livingroom. One key element is to keep the furniture profile frame on the smaller side or do one larger piece that provides the ultimate comfort while using less substantial pieces to accent it.Too much bulky furniture in a small room will eat up valuable space and make it feel cluttered. You can have more pieces of furniture if they have a slimmer frame without the room looking overwhelmed. Another option is to have multi-purpose seating. This means having an ottoman that can also function as seating for guests, or maybe even poufs that can easily be stowed away. The image below is from a houzz.com article. The design is for a small space, but seating has not been compromised. There is plenty of space for people to sprawl out with the large sectional. 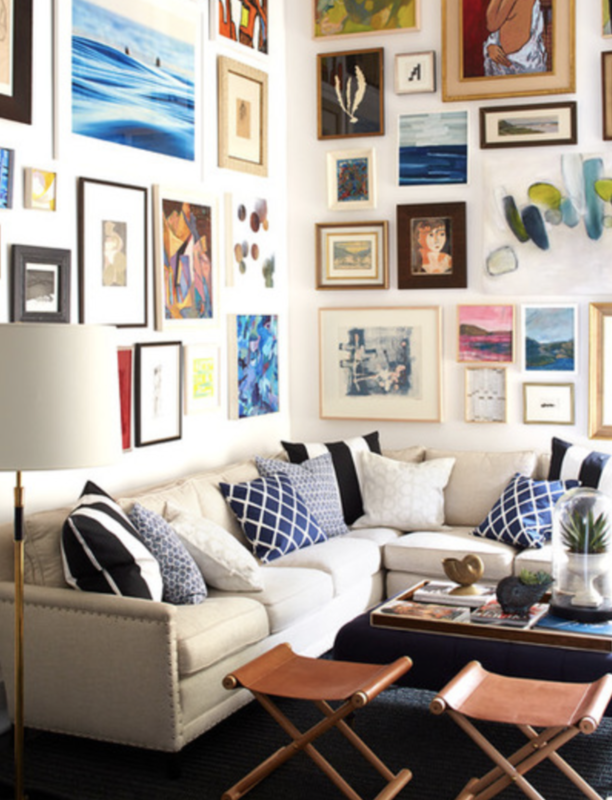 The sectional works because while it is a large piece, it recedes towards the wall and is just one piece. There is still ample room to move around and the sectional provides lots of seating. The leather stools provide additional seating without taking up too much space and can likely be easily stowed away if more space is needed. 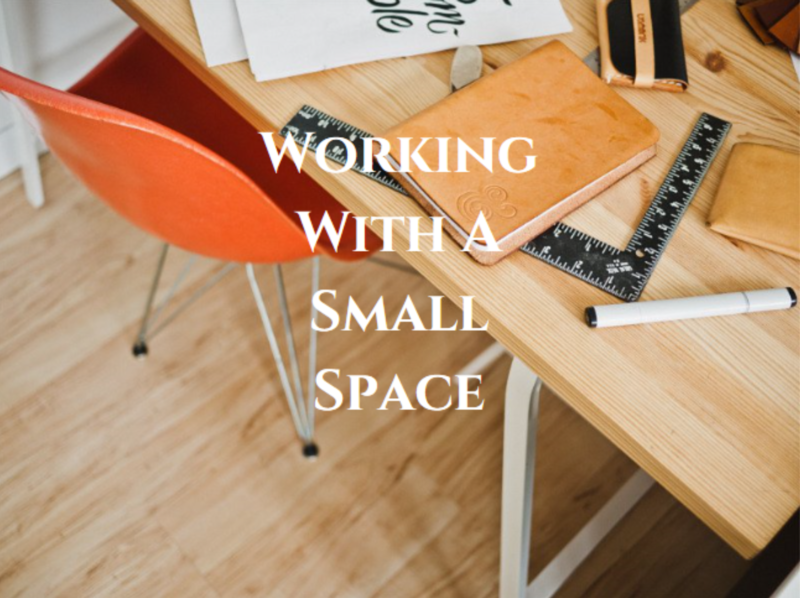 Nothing makes a space feel small like clutter. It’s so easy to get caught up in your everyday routine and let things keep building up. A common mistake when people try to get organized is that they go buy bookshelves or other storage devices before taking inventory of what they have or actually plan to keep. The end result is that the individual now has the same level of stuff and now additional storage items that don’t accommodate the need and add to the clutter. Think of the items you use regularly, what items should be on display and what if anything, should be discarded or donated. Group common items and determine what will stay, then buy storage if needed. The flow of a space is so important. Make sure that there are clear pathways around the room and furniture. Make sure that furniture does not obstruct a walkway. If the only option is to place furniture in front of a doorway, aim for at least 3ft of walking space around the item. Accept what the space is rather than trying to make it something that it isn’t. Function should be the first priority in the design.